If you consider kumquats to be something from a Herbal Essences ad, think again: they have a sweet, tart flavour that will cut through the fatty richness of meats such as pork loin. What's more, they're currently in season – making this dish from Adam Byatt at Clapham's Trinity an ideal treat this weekend. Peel and finely slice the onions. Pick the leaves from the thyme. Season the pork well with salt and pepper. Heat a flameproof casserole over a high heat until hot, splash in some olive oil, then place the pork in the pan and brown on all sides. Remove the pork and turn the heat down to medium. Add the onions and brown gently for 5 minutes, stirring regularly to remove all of the cooking juices from the pan (this will give body to the finished dish). Once you are happy the onions are browned, add the kumquats and place the pork on top followed by the thyme leaves. Now pour in the stock and add the star anise. Place the uncovered pan in the oven. Roast the pork for 45 minutes – the meat should be firm to the touch and still moist, but with no sign of blood when pierced in the centre with the tip of a skewer. Remove from the oven and leave to stand for 30 minutes to relax the meat and allow the juices to settle. 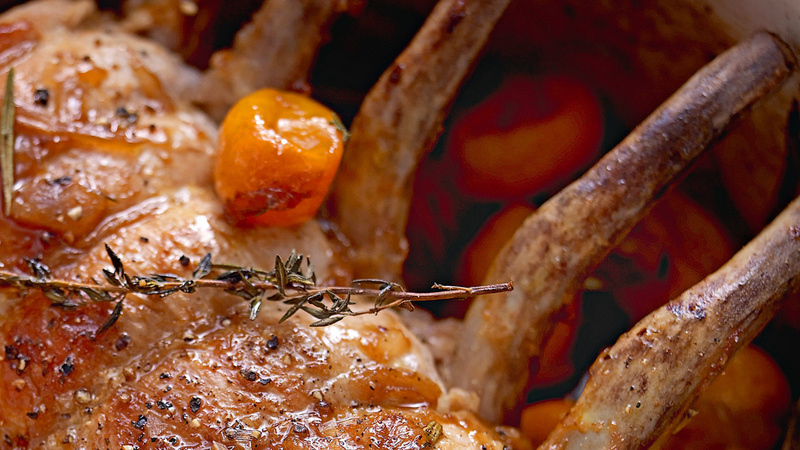 Take the pork out of the pan and slice between the bones. Serve with the pan juices spooned over, and the onions and kumquats. Trinity, 4 The Polygon, Clapham, SW4 0JG; trinityrestaurant.co.uk.